Although it wasn’t in the forecast, we had a beautiful white Christmas. It snowed almost all day on Friday, the 23rd and the entire day on Christmas Eve. Here is what it looked like out our back door just after daybreak on Christmas morning. How many times have you said to yourself that you wish it would snow on Christmas Eve and be gone a few days later? I guess we have to be careful what we wish for, huh? And here is the same view this morning…only five days later… at around the same time of day. We’ve had amazingly mild temperatures for the past three or four days with lots of rain and high winds and in the blink of an eye, the snow vanished. The grass has remained green because we haven’t had many nights to speak of where the temperature has dipped to below freezing. 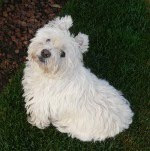 Even Mac prefers the outdoors without snow because there are more places for him to sniff and explore. This morning while Mr. Painted Quilt was at the gym, I decided to put Christmas to bed for 2011. The antique poinsettia quilt on our bed has been replaced with this Lemoyne Star , pieced by me and quilted by my friend Nancy who is in China for the next two years because of her husband’s job. Miss you, Nancy! 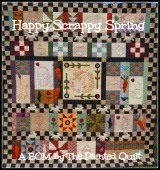 Nancy did all the free motion quilting in my favorite motif…feathers! The photos really do not do justice to the quilting. In our other house, I always referred to our guest bedroom as ‘Emily’s room”. Do we have a daughter named Emily? It’s a name that I’ve always loved and over the years, it just kind of evolved into a girl-child’s room. After a few changes and additions, our Nova Scotia home is also ready for Emily…or anyone else for that matter…to pay us a visit. When I unpacked more boxes a few weeks ago, familiar treasures from Emily’s room in Ontario began to reappear. With a few nails here and a little folding there, the transformation started to take place. Of course I had to put my Raggedy & Friends quilt on the bed, along with Miss Ann herself. while surrounded by familiar things that were packed away for what seemed like a lifetime. 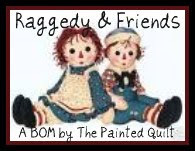 For those of you who might be new to my blog or are visiting for the first time, the Raggedy & Friends quilt was a free BOM that I designed and released about a year and a half ago. The PDF files are still available to download on the right sidebar of my blog just by clicking on the individual links. And I really have to show you these neat labels that I ordered and received only a few days ago. They are made from 100% natural cotton twill and the quality is wonderful. They come in a roll as shown below and are very reasonably priced. I started to compose this post around 10 a.m. and am just finishing it now. In the interim, our mail was delivered to our roadside box and I decided to run out to check if any of my orders had arrived. No orders but a card was left indicating that there was a parcel waiting for me to be picked up at the post office. I whined asked Mr. PQ if he would drive me to the post office in town and I was thrilled to bits when I found out that the parcel was the one that Mary had posted on December 7th that we both thought had been lost in the mail. The timing couldn’t have been better. I am writing these next words with tears rolling down my cheeks…not because of what I am about to say…but because the wording on the plaque that Mary sent says it all. The source to my cancer has been determined and treatments will commence on the 23 of this month. May the joy and spirit of Christmas last throughout the year. Thanks to everyone who entered my Christmas giveaway. I wish that you all could have won a copy of Joanna’s book because it is definitely one worth adding to your collection. and selected #156 who happens to be Lesley Carruthers. Congratulations Lesley! I’ll be emailing you for your snail mail address as soon as I finish up here. Thank you all from the bottom of my heart for your thoughts and prayers with respect to my health issues. The good news is that the latest PET scan has shown that the cancer has not spread but that there is some “increased uptake” in the original area. After our consultation, they immediately made an appointment for me to return to Halifax on Friday of this week to meet with an oncologist who specializes in this type of cancer in order to determine the next step. May this Christmas be your best one ever! It’s been a while since my last giveaway so in the spirit of the season, I decided that there’s no better time than now! 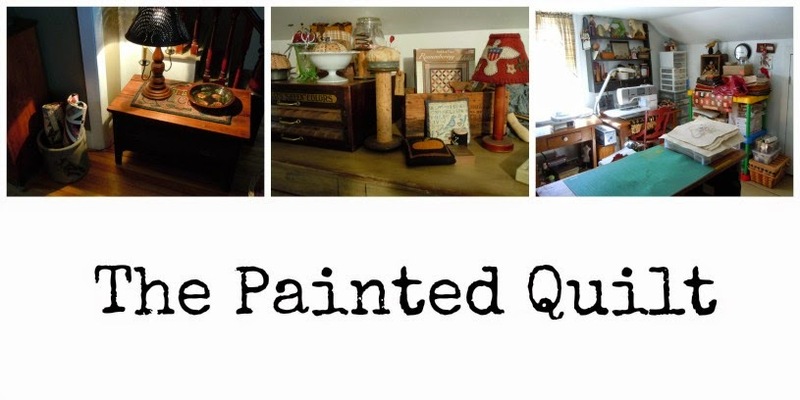 Earlier this week I received my latest quilting book order from Martingale Publishing and thought that it would be a good time to take inventory and make a list of all my books. If the truth be known, I couldn’t remember what I had or didn’t have and in so doing, guess what I found? A duplicate…and as smarty pants…I mean Mr. Painted Quilt said, “Only one?” (I’ve been known to do this before with novels). I guess I really liked the book, huh? So if you’d like to add this brand new, never-been-used copy of Joanna Figueroa’s book called, “fresh vintage sewing” to your collection, then just leave me a comment telling me so. It’s full of different projects…like pincushions…which is probably why I bought two of them…as well as quilts and other sew-y things. Oh…and to sweeten the pot, I’m going to include a bunch of fat quarters as well…and I’ll ship internationally! You all know the drill. If you have yourself set as “do not show email address” in your blogger profile, then I won’t be able to contact you. No email address means no chance of winning. Just include your email address with your comment if you’d rather not change your settings. My friend Mr. Randon Number Generator will spin the wheel sometime on Wednesday morning, the 21st, after which time I’ll announce the winner. I took the above photo of our house last night around 8 p.m. Your thoughts and prayers would be appreciated as we travel to Halifax tomorrow for the PET scan results. Note: My Christmas giveaway is now closed. Thanks to all who entered. Martingale Publishing had the most wonderful Black Friday sale where every book on their website was on sale for 50% off. Guess what I picked up at the post office today? At least once a month they offer 40% or more off selected publications. If you’d like to receive their newsletter, you can find the link to their website HERE. I’ve made several great buys, many of which included free shipping. Just recently I signed up for Jeanneke’s challenge called, “Building houses from scraps”. Well, I love scrappy and I also love house blocks so this to me sounded like a marriage made in heaven. The challenge includes making one 3” finished house block a day…or any sized block for that matter…starting on the 1st of January 2012. The goal is to have enough blocks made by the end of the year for a quilt. If you’d like to read more about it or to be able to print off the free PDF pattern, please go HERE. It was suggested that the easiest way to make the blocks was to paper piece them…something I’ve never done before. So last night I watched a couple of You Tube tutorials featuring paper piecing and a few of them suggested using the “Add-A-Quarter” ruler. Today I purchased mine. It looks easy enough but I’ll know exactly how easy after attempting my first one. A year ago this month we arrived in Nova Scotia. This past year presented us with many challenges but we both agree that the move was a positive one. Can you believe that there are a few boxes that still need to be unpacked? This past week, I managed to unpack 4 more boxes with Frankie’s assistance. Look closely at the photo below and you’ll see a pair of blue eyes peering back at you. That box still continues to provide entertainment for both Frankie and us too just watching his antics. If you dislike brussel sprouts, then you’re probably in the majority…until now. My friend Ter’e (no blog) sent me another winning recipe which I’d like toshare with you. Done this way, you’ll be converted…really! I purchased 2 pints (those little square boxes) of fresh brussel sprouts at the farmer’s market last Saturday. To prepare them for this recipe, cut off the end and slice them in half lengthwise. The yukky outer leaves will fall off by themselves. Place the prepared brussel sprouts into a baking dish that is large enough to allow them to be in a single layer. and add freshly grated parmesan cheese. Salt and pepper to taste. Of course freshly ground pepper and sea salt are better. Drizzle some extra virgin olive oil over the top and bake in a 375F oven for about 20 minutes, stirring once, until golden-y. When done, add more parmesan cheese and olive oil. Toss to coat and serve. On Monday of this week, I had my second PET scan. It was a very long and exhausting day and it’s taken until today to start to feel a little more like myself again. Next Monday, I meet with the chief oncologist in Halifax to discuss the results. As each day passes, I’m gaining a bit more confidence when it comes to our Christmas decorating. I found that if I introduce ‘new’ things a little at a time, then Frankie seems to accept them more readily…says I holding my breath. Here’s what little I’ve gotten away with accomplished over the last few days. I added a few things to the fireplace mantel and the shelves behind it. There was an awesome craft show this past Saturday in Annapolis Royal with some very talented artists and crafters participating. I need absolutely nothing but when I saw this doll, I just knew she had to come home with me. I very rarely played with dolls when I was a child, preferring my box of crayons or paints but I think I’m making up for it as an adult. Her face is sculpted and the gal who painted her facial features did an incredible job. She seems very content to watch me as I create in my studio. I think I’ll name her ‘Patience’. When we lived in Florida, I purchased these hand carved spool Santas. Here’s another photo to give you some perspective as to where they reside in my studio. Below is my Coke bottle Santa collection. Several have been gifted to special friends and family over the years and these are the ones that remain. I designed, sculpted and painted these little guys about six or seven years ago and they are made from authentic vintage glass Coke bottles. Each one has a different theme and they are Mr. Painted Quilt’s favorite of all our Christmas decorations. Frankie helped us make the decision to forego our big tree this year. We decided to ‘try’ just the feather tree and see what happens. and this little seasonal vignette sits atop the pine dough box in the kitchen. I’m hoping that there will be more to come.